A 17 month old female is brought to the ED by her mother for emesis and fever. The mother thinks that her daughter may have swallowed something last night because the child had made a "wheezing sound" while breathing and appeared uncomfortable. There was no witnessed ingestion. 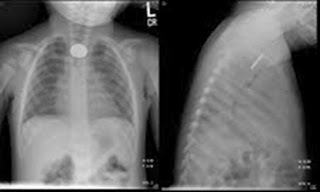 The child appears well with normal vital signs and is playful and interactive. Her physical exam, including pulmonary examination, is normal. You order a PA and lateral chest X-ray. What does it show?